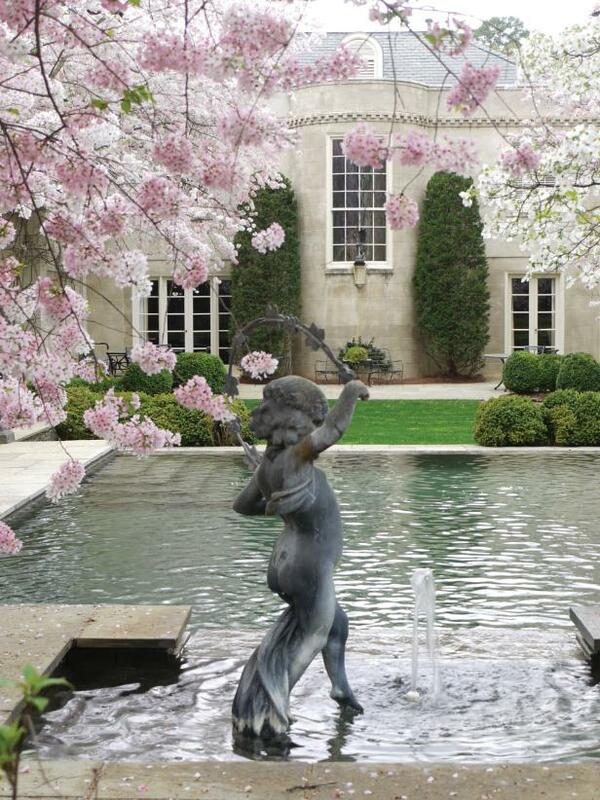 Photo By: Deborah Cerbone Associates, Inc.
A whimsical statue and water fountain animate this lovely water feature. Trimmed shrubs and powdery pink Cherry Blossoms surround the pool deck beside a French Provincial home. 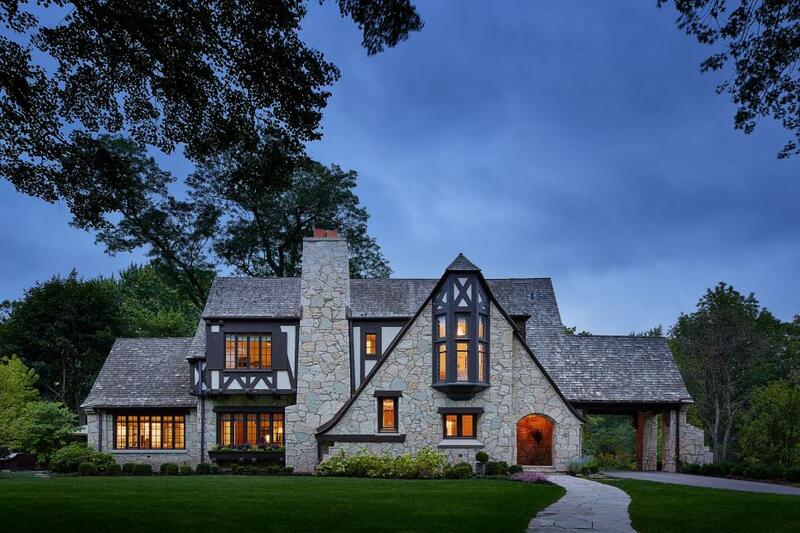 Clad in gray stone with a hint of Tudor style, this renovated home exterior is lovely to look at it. Designers were able to successfully mix styles by keeping with the home's exterior neutral color scheme across the outdoor furniture and accessories. 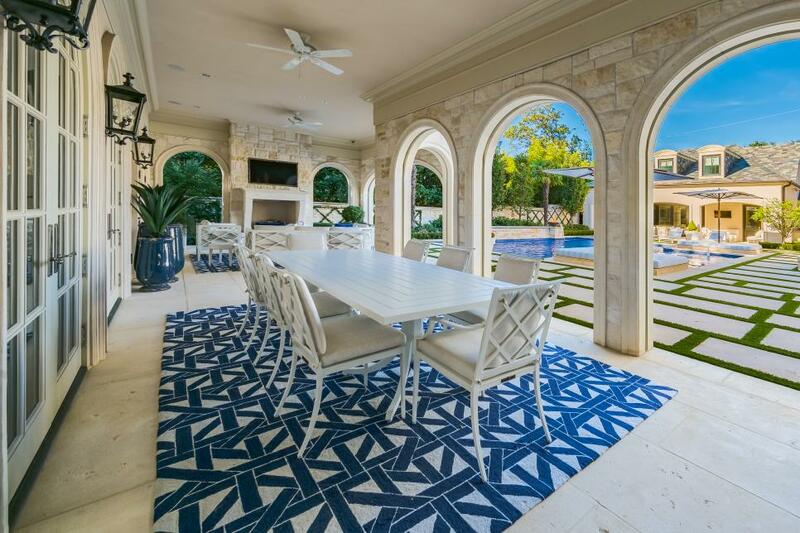 The more contemporary patio furniture blends well with the French Provincial theme because it does not take a lead in the overall scheme; rather, the furniture's simple lines and structure blend with the evenness of the architecture. Landscaping by Mark Scott and Associates. Whitewashed terra-cotta pots and ceramic pitchers work together to set the scene. 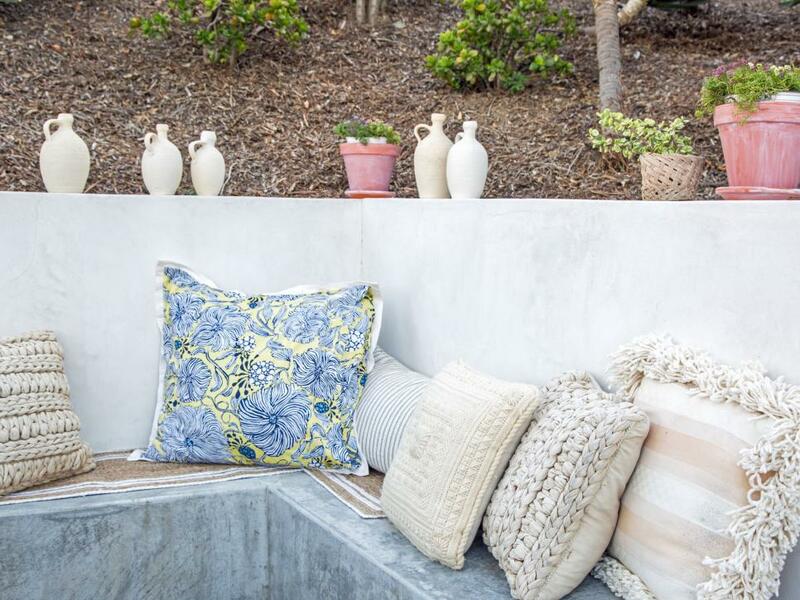 Start out with a few creamy pillows and add to your collection over time. Yellow and blue is a classic color scheme that also feels very French. To visually delineate the pool area from the formal garden, Deborah Cerbone Associates lined one side of the yard with flowering bushes. Across the way, a pool house flanked by pergolas gives the owners and their guests room to relax after a swim. 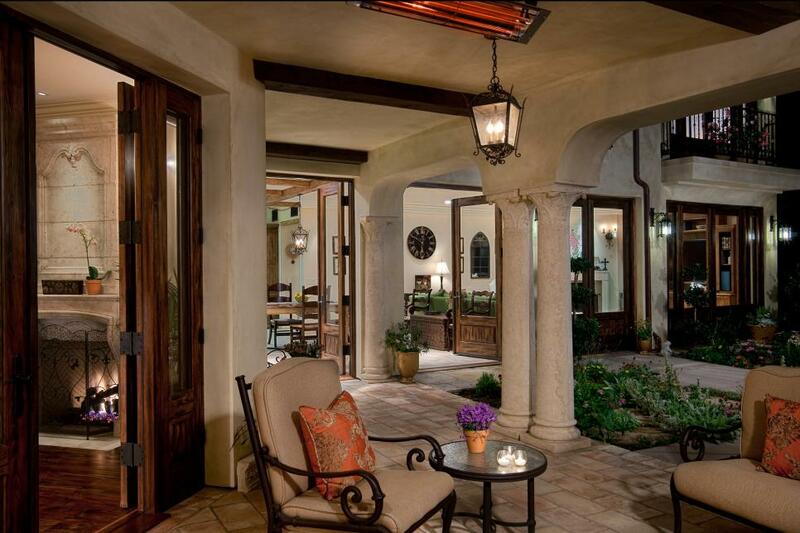 This outdoor living area becomes one with its interior counterpart once the large French doors are swung open. Contemporary outdoor furniture adds an updated feel to the French country home. This charming home boasts a primarily stone exterior, arched windows and a neatly landscaped backyard. A gorgeous swimming pool provides the ultimate spot for relaxation. 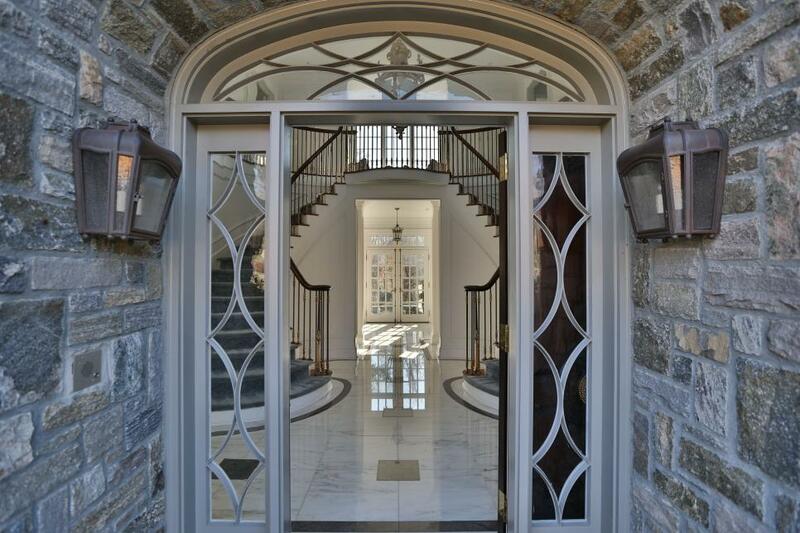 Entrance: French Normandy Beauty in New Canaan, Conn. 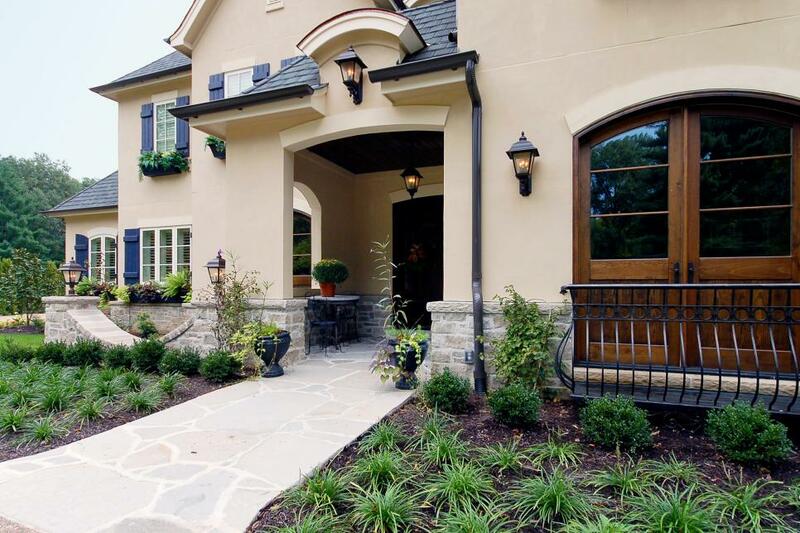 The home's stone front porch cascades into a two-story foyer with a gorgeous double staircase. The foyer boasts luxurious marble floors for a grand first impression. Gas lanterns illuminate the entry to this French country abode. Copper-roofed arched dormers accentuate the entryway. 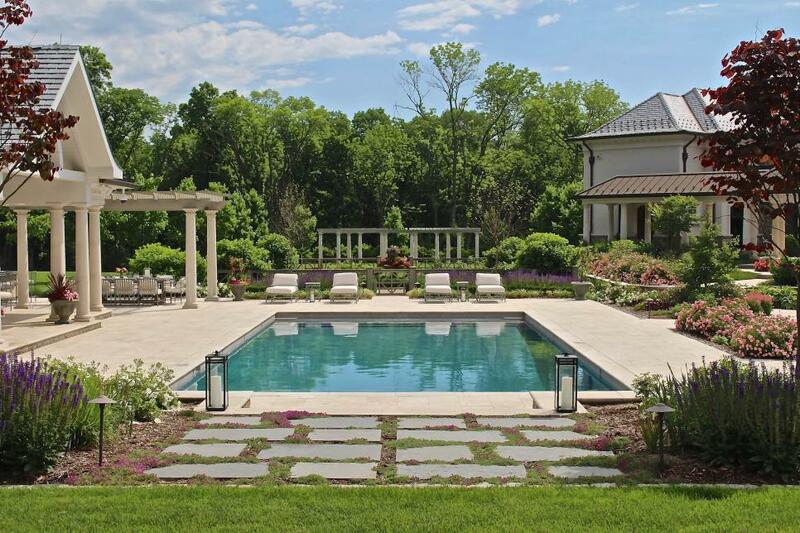 The design of this elegant French country estate allows for the seamless transition between indoor and outdoor spaces. On the first floor, all of the public spaces in the home are connected to the outdoor spaces by French doors. Flowers and bushes surround this swimming pool, making the space feel quiet and secluded. With four lounge chairs straight ahead, the owners can read or sunbathe after a swim. 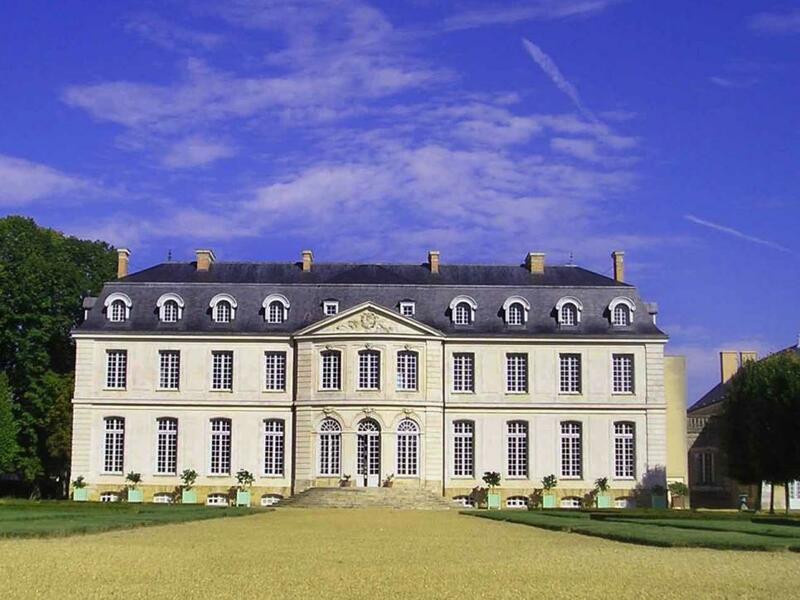 The Chateau du Grand Luce is an 18th century estate in France's Loire Valley. Its construction began in 1760 and the 45,000-square-foot mansion was completed four years later. American designer Timothy Corrigan bought and restored the house and gardens. 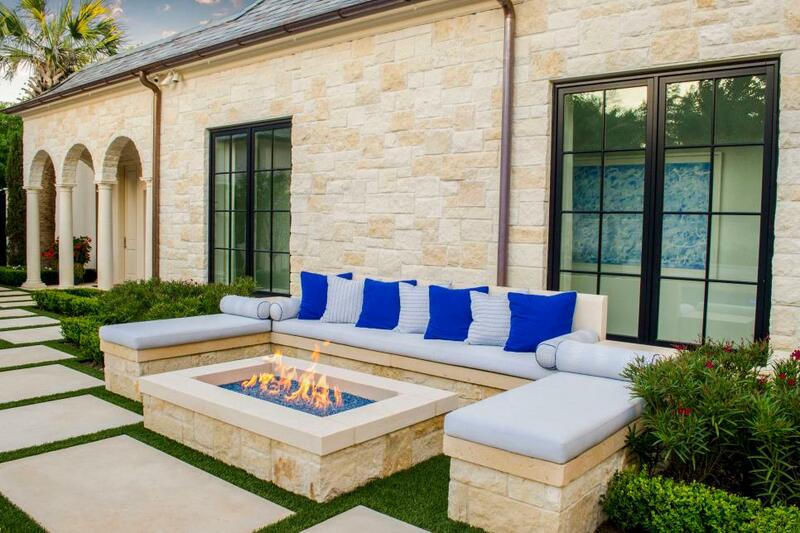 A cushioned bench wraps around the fire pit, creating an intimate spot for gathering with friends. Meanwhile, the alternating powder blue and cobalt pillows nod to the home's French country style. 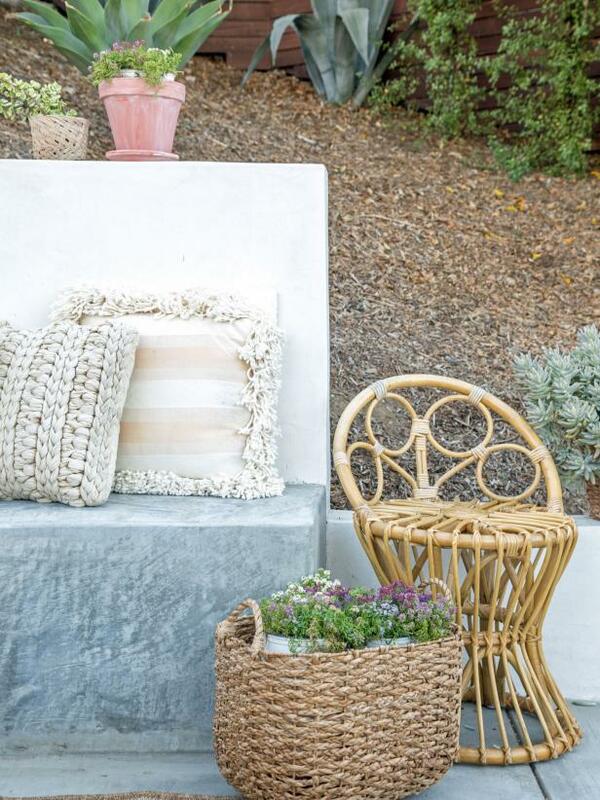 Flowering plants peeking out of a basket is an easy addition to make to any outdoor space. Purchase a number of plants and group them together inside a basket, and use them in several spots around your deck. A simple small chair is an easy addition to any of your existing furniture. Backyard & Exterior: French Normandy Beauty in New Canaan, Conn.
Rich gray stucco pairs with classic gray stone and sloping gables to create a stunning French Normandy-style home. A lush backyard with beautiful landscaping adds appeal to the home's already impressive exterior. The old cliche "pretty as a picture" cannot begin to describe this gorgeous home in California with landscaping designed by Mark Scott and Associates. Though the look and feel of the exterior appear rustic and unmanicured, the designers set greenery meticulously to a render a pastoral charm and old-world sensibility. Everything about this home is relaxed, warm, elegant and utterly inviting. When this patio garden was conceived, the landscape architect was remembering a year in Provence. 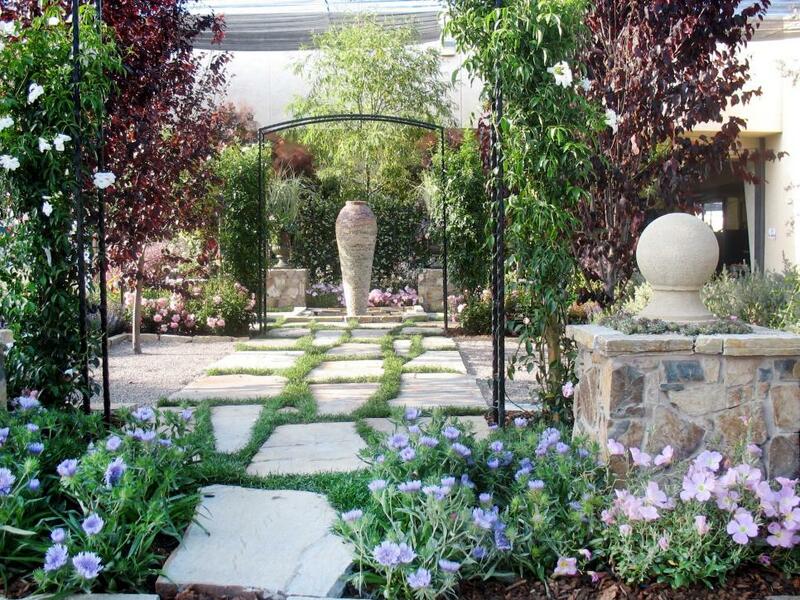 The French country garden boasts concrete pavers, a trellis covered in cup-and-saucer vines, purple leaf plum trees and flowering ground cover.